ICStation team introduce you the Wireless Single Point Calling System based on the ICStation UNO and the ICStation Mega2560 compatible with Arduino. The Wireless Single Point Calling System works under the DC 5V voltage and uses the NRF905 Wireless Module to fulfill the communication and then realize the wireless call system.Besides, this system can call for more than one time and is available for query. What’s more, it can do communication if the distance is not too far. 1) When the sending part and the receiving part are powered on, the LCD1602 boards display the characters “HELLO!”, which prove that the sending part and the receiving part are fine to work. 2) There are four buttons in the sending part. ① The first one is the start button.When press it, the sending part enters to the preparing state and prepares to transmit data. At the same time, we can notice the preparing reminding correspondingly. ② The second one is for increasing the data. When press it, the sending data will become one more. And we can see the data on the LCD1602 changes accordingly. ③ The third one is for decreasing the data. When press it, the sending data will become one less. And the current data on the LCD1602 changes accordingly. ④ The fourth one is the sending button. 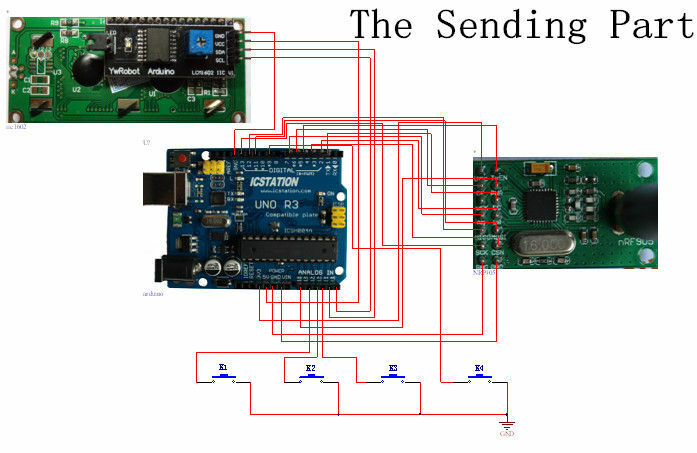 When press it, the sending part will transmit the data and the LCD displays the sending reminding. ① The first one is for query. When press it,the LCD1602 enters the query page and we can see the first data transmitted by the sending part. ② The second one is the page turning button. When press it, we can see more than one data from the receiving part.by querying, we can see the first three data that transmitted by the sending part. ③ The third one is for data deleting. When press it, the current data will be deleted and the LCD1602 displays the next data .Let us delete the first data 10 to see the effect. 2.Connect the LCD1602 to the ICStation Mega2560. 3.Connect the press key to the ICStation Mega2560. 1.Connect the NRF905 to the ICStation UNO. 2.Connect the LCD1602 to the ICStation UNO. 3.Connect the press key to the ICStation UNO. Interesting. Thanks for sharing this!